variations in archaeoastronomical and archaeogeodetic variables. So-called astronomical "constants," such as days per year, are in fact temporally variable. Formulas for this variation have been refined by modern astronomers using ancient Chinese and Mesopotamian eclipse records. The inclination angle of the earth's axis of rotation (obliquity of the ecliptic) also changes with time. In previous epochs the duration of solar and lunar orbit and the apparent position of the moon and sun, for example solstice rise/set azimuths, were different than today. Some of these differences are significant enough to have analytical utility, and, if properly understood and employed, are logical tools for archaeotemporal questions. I hope the considerations and sample cases herein aid in understanding the tools employed in archaeogeodesy, archaeocosmology, and other research applications, past and present. The Archaeogeodesy Pages discuss historical knowledge of geodesy and findings related to the monuments discussed herein. Sources and bibliography used in writing these pages are found on the Archaeoastronomy page. In the study of alignments and relationships of ancient monuments, determination and comparison of ancient and modern angles is necessary. Even ancient monument latitudes have changed over time due to secular polar shift, albeit slightly. Given the moon's angular width of 0.490-0.553° it can be easily seen in Table 1 that the horizon azimuths at Stonehenge about 5,000 years ago were two lunar/solar diameters north of where they are today. Table 1 offers three temporal comparisons for sites discussed herein. The spreadsheet, Neolithic Calc displays illumination azimuths and provides user input of the variables affecting illumination angles, and numerous sites. The archaeogeodesy.xls workbook has more sites, code terms, and other features, including a new eclipse calculator. The archaeogeodesy.xls applet, the version in development with the most recent features and with a global sites database, is a larger file. Epoch Calc is introduced below. Table 1. Temporal Epoch Changes in Constants, Obliquity, and Horizon Angles. Astronomical azimuths for the monuments are degrees from poles. By simply comparing alignments and past illumination geometry, temporal illumination changes can be employed both to test claims in literature and as date-reaching mechanisms. Proposed intentional solar and lunar alignments can only be assessed for accuracy after first determining equivalent angles during the construction/use epoch. Reconsidered in this light, many published claims for alignments may not pass critical scrutiny. Past authors may not have considered temporal variables. Alignment claims in literature require critical reassessment in temporal terms before acceptance, in particular, for authors who make no mention of temporal changes. Photographs of sunrise over the Heel Stone at Stonehenge epitomize this problem and convey a false impression of static illumination angles over time. Geometry in the landscape can be determined, measured, and analyzed objectively, and with extreme accuracy, especially when your 360° scale encircles a planet. For example, not far from 14-acre, 100-foot-high Monks Mound—the largest-in-volume prehistoric earthen mound in the Americas—the solstice horizon angle and solstice rise/set azimuths from the poles approximate one-sixth of circumference (CIR/6). I read that Monks Mound's placement may have been intentional due to the 60° solstice angle at the site, so I investigated. The latitude where the solstice angle and azimuths equal 60° changes over time. During Monks Mound's occupation span, the 60° solstice latitude was nearly thirty miles south of where it is today. Even today, it is still south of Monks Mound. 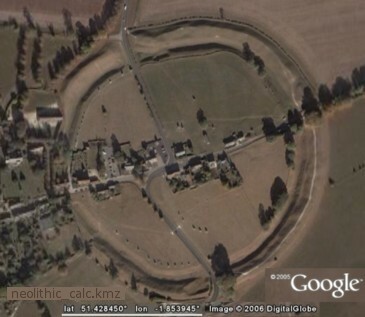 Monks Mound and the 60° solstice angle will only coincide briefly as that node passes through Monks Mound. With this finding, I questioned the claim and the builder's hypothetical intentions. This relatively static property of latitude seems a more plausible reason for the placement of Monks Mound than the temporably variable solstice rise/set angle. Illumination geometry changes dramatically over time compared to latitude values. In cultures with a long tradition of mound building, knowledge of this temporal change is to be expected within the hypothetical framework postulating such intentional alignments. After all, change in obliquity dramatically impacts local illumination angles during the temporal sequences represented at archaeological remains. As demonstrated at Monks Mound, illumination geometry is not the only rationale to consider in analyses of placements and alignments of ancient monuments. The geodetic geometry that determines illumination geometry is both fundamental and more constant. The following example, in Neolithic Europe, moves discussion from consideration of the basic, readily observable geodetic variable—the latitude of Monks Mound on a moving earth—to a more complex consideration, the geometry of solar system motions, hyperborean knowledge—simply put, illumination angles. In a 2000 paper, I noted that the latitude at Avebury equals the circumference of the earth divided by seven (CIR/7), with less error than the diameter of Avebury. I thereafter noted the simple geometric relation of the Stonehenge-Heel Stone alignment. The Heel Stone azimuth is 51.4286° E. of N., exactly CIR/7. I had questioned the Heel Stone—winter solstice sunrise alignment because the solstice azimuth has dramatically changed, and finding the Heel Stone's precise CIR/7 azimuth added to my doubts. Occam's (Achem's) razor, the principle that simplest explanatory theory is the most probable, dictates that the 1/7th fraction of circumference adequately explains the Heel Stone angle. Besides, one-seventh has unique relevance to circles because pi nearly equals twenty-two sevenths (22/7 : pi = 1.00040250 : 1). I almost dismissed the summer solstice sunrise alignment rationale for the Heel Stone. CIR/7 not only fits the 'simplest explanatory theory' concept, it fits circularity. A 1/7 azimuth alignment in a circle makes more sense than apparent, time-varying solar motion. After all, one-seventh is a constant reference, not a moving target. The next example adds more complexity, with consideration of lunar dynamics and claims of observatories, not just alignments. Study of ancient earthworks in the Ohio Valley, in particular of the grand Middle Ohio River Valley sites, the Newark Earthworks and Marietta Earthworks, illustrate a variety of considerations. "Our analysis shows that the earthworks conform to a simple but precise geometric construction based on a single unit of length. Our work has also revealed substantial evidence that the earthworks may have been laid out at least in part as a lunar observatory." However, the modern earthworks are not the ancient ones, they are the product of multiple, undocumented "restorations." Three surveys were conducted prior to the restorations. Hively and Horn admonish, "...no reliable conclusions can be formed from current survey alone." Middleton's 1887-88 survey assessing geometrical regularity and previous survey accuracy demonstrated the unreliability (for precise quantitative analysis) of earlier surveys. Although primordial forest still covered the Newark works in 1847, by 1887 Middleton was only able to produce surveys of the surviving major features remaining today, and plowing had impacted parts of the Octagon, but not the attached Observatory Circle. Holmes' 1892 survey precisely agreed with Middleton's Observatory Circle 321.3 m mean diameter measure, the "single unit of length" cited by Horn and Hively. Hence, this diameter is considered a reasonably accurate determination. Horn and Hively report that Middleton's survey results agree with their after-restoration survey "to within 30' arc for azimuth measurements and to within 1 m for distance measurements." Horn and Hively also report agreement with an unpublished survey by Eddy in 1978. In sum, sufficiently accurate surveys of the two major constructs at Newark (Newark Octagon and Newark Circle) exist to accurately make several analyses, including assessing past alignment claims. This suitability prevails in no small part due to the grand scale and proportions of the features, grand enough even for comparison with global size. Middleton reported a 51.45° azimuth for the Observatory Circle (CIR/7 = 51.43°) and a mean of 51.98° for the parallel earth banks between the Octagon and Observatory Circle. My GPS readings produced a 51.52° azimuth from the center of Observatory Mound to the gateway at the opposite apex of the Octagon work. I fail to find mention of the CIR/7 angle in Middleton or in subsequent related literature. 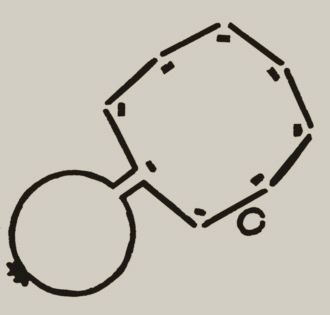 Hively and Horn mention the 7:1 ratio of the Observatory Circle with the small Octagon Circle without further comment. Hively and Horn also warn, "the number of alignments formed by connecting arbitrary points in the structure is so great that the likelihood of generating chance alignments with any astronomical phenomena is disturbingly large." They then go on to note 17 plausible lunar alignments for Newark. In a preliminary study Possible Geodetic Properties and Relationships of Some Monumental Earthworks in the Middle Ohio Valley, I first considered the local latitude to longitude ratio for the Octagon and Observatory Circle as a possible reason for the earthwork's alignment. At Newark, the distance ratio of equal latitude and longitude degree distances is about thirteen to ten (= 1.301 : 1.0), forming angles of 52.45° and 37.55.° This angle was reported in the Newark surveys, but without mention of the simple local geodetic variable—the proportions of equal angular measures in the cardinal directions, axes employed in latitude determination. Middle Ohio Valley site alignments may be due to their latitude to longitude ratio angles, and many of these have been assigned to lunar major in previous studies without discussion of the near coincidence of these angles. In the context of one-seventh and an octagon, I also noted this angle approximates the proportion of seven-eights squared (1.306 : 1 = 52.56°) and lunar apogee-perigee squared—the lunar illumination ratio (1.3025 : 1 = 52.48°). Plus, the two squares formed by the Newark Octagon vertices (using my GPS readings) have a ratio of average sides approximating 7 : 8 (0.872 : 1.0). 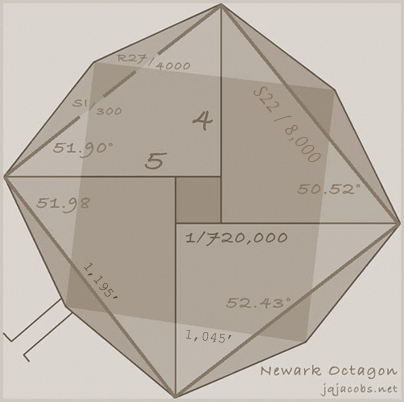 My Occam's razor choice to explain the Newark Octagon alignment has shifted several times. From latitude to longitude ratio (52.45°), I turned to the more accurate CIR/7 and 5:4 triangle tangent (51.42857° vs. 51.3402°) angles. Laid out on the geometric grounds at Newark we find the same triangle formed by the Monks Mound's latitude in relation to the equator (a 5:4 triangle with the geodetic radius forming the hypotenuse). The angular difference between 1/7 of circumference and 1.25 atan is slight. We lack the survey accuracy to differentiate these two angles in the Newark alignments. Using a larger scale, the earth instead of the earthwork, five-quarters atan is emphasized by the latitude of the largest earthen mound in the Americas, downriver at Cahokia Mounds. One-seventh is a feature in England, at Stonehenge and Avebury across the Atlantic. With two nearly-equal, barely-discernible choices of simple geometry, I preferred assigning the reason for the alignment to the 5:4 triangle tangent angle, the 'most plausible' option on the basis of cultural proximity and simple geometry. As science goes, I knew complexity might intervene and that I might circle around, proving my choice wrong. That took only a few weeks. Octagons have eight sections with adjoining 45° angles at their center. The radian measure of a semicircle is pi, and that of a 45° angle is pi/4. Considering the azimuth measured N of E, atan pi/4 is 38.1460.° The atan of 4/pi equals 51.854° (also possibly the slope of Khufu's pyramid in Egypt). Thus, in addition to the hypothetical lunar major alignment, there are three possible geometric reasons, one geodetic reason, and a lunar reason to explain the monument azimuth. Now, I wonder if the builders were aware of all five of these, six with seven-eights squared included. The alignments of parts of the Octagon accurately present several of the possibilities. Thomas' survey reports angles of 51.53 and 50.75 degrees. The following graphic presents four azimuths for the largest inset square (determined with my GPS readings). Alignment studies present a real conundrum, and researchers easily overlook the simplistic and focus on the complex, temporally-varied astronomical illumination. I learned the wrong approach from the archaeoastronomy literature, and the lesson from direct experience at great temporal cost. This essay intends to divert others from wasting similar energy. Illumination coincidences in large scale architecture actually do frequently evidence astronomic alignments, and for good reason. Surveying property and establishing use lines, be it today or in ancient times, is geodesy and geodesy employs astronomy. You cannot survey the earth without astronomy, just as you cannot arrive at the laws of gravitation without elliptical orbit mathematics and cosmographic measure. If a society uses astronomic horizon points to orient property lines, structures will evidence astronomy. Simple. That's a really acute Occam's razor: surveying employs astronomy, subsequi, of course there are alignments everywhere. And some cultural systems do use illumination lines instead of cardinal lines to divide space. Unraveling what is or is not an astronomical alignment, or an observatory, is part of the conundrum. As in all science, complexity enters the equation eventually—there are yet more plausible explanations for alignments. The same reasoning repeats for navigation. The methods are more difficult on water, but everywhere people have ever traveled using navigation, astronomy lines were employed in some form. Navigation has function, and geodetic knowledge depends on astronomical observation. Before mechanical chronometers, navigation on land or water was possible using astronomy; the moon was the chronometer. At certain latitudes, with powerful tidal rip currents in channels and near islands, surviving water crossings can literally depend on lunar prediction, thus providing a functional rationale for lunar calendars and alignments. The complex of many different possibilities to explain alignments is a multiplier of the probabilities. There are other angles in the same range as Newark's lunar major, creating an entire complex of mathematical possibilities alone. Examples of these are the cosine of latitude near Marden Henge is 5:8 (51.3178°), and, on Windmill Hill above Avebury, the local longitude:latitude ratio is 5:8. To this, I would add more complex considerations, like the entire realm of codified non-verbal information in architecture, intentional codification of data, employing context for meaning, place as context with meaning, and myriad distinct cultural possibilities. Add stars and constellations, since every alignment points to two stellar positions, and the possibilities are dizzying in number, creating the real conundrum. I could not agree that the Octagon lunar alignments evidenced an observatory without further proofs. At this juncture, looking behind all the wonderful coincidences was incumbent. Alignments, the joyous poetics of light and shadow on earthen geometry in cosmic interplay had to be left behind to refocus on the underlying structure, the unity characterizing the cultural expression. Just like an astronomer on a quest to discover new planets is ever alert for the slightest misinformation—any hint of movement anywhere on the stellar backdrop of uniformity, with the remaining archaeological record we are also left with the task of assembling reason from just bits of information. Complexity presents unique challenges to scientific research, and the Octagon is a classic example to add to the list. Once a certain complexity is achieved, science by sampling—polling instead of voting, not counting every vote, and not counting votes as intended—can produce false conclusions. How do we solve such a conundrum and discover the rhythm, the purpose behind the light show? We scientists scion, codifying divisions of unity, building a foundation: taxa and taxonomy. Observations are structured around a research question, for example, "What would distinguish an observatory used to measure cosmic scale from ordinary alignments?" My hand goes up fast here. Two or three observatories measuring parallax would be quite useful. Eventually astronomers build two observatories and compare observations. Employing parallax is a fundamental and requisite step in measuring cosmic scale. This capability, simultaneous observation from two positions, should produce specific geodetic evidence; placement of an array, direct survey between sites, evidence of triangulation nets between sites, distant hilltop bonfires to establish accurate nocturnal geodetic references, concerns with level in geometric constructs, moats or water-leveled features, large open fields for geometers, lots of poles, towers, the capacity to accurately measure triangles with 500 to one proportions, and more. Observations at diverse stations need to be synchronized, typically by signal fire towers. Eventually, with greater sophistication, observatories may be placed across the continent or globe in precise, known relationships. The unity of such tasks leaves a mark. Such evidence is found around and between the major earthworks in the Middle Ohio Valley. In another approach, if a culture had astronomical observatories, parallels with known historical societies should be in evidence. Evidence from Newton's perspective, high on the shoulders of his four giants, should be discernible. You have to observe the moon with mathematical precision before achieving Newton's place on that ladder. You cannot pass Galileo's insight without thinking heliocentrically, or achieve Kepler's understandings without elliptical geometry. The computational mathematics of modern astronomical discoveries should be in evidence, not just alignments. And if these tools are unearthed by archaeoastronomers, even this evidence could still exist by coincidence, or the tools discovered could serve another function just as astronomic lines in the landscape might serve navigation and land use definition functions instead of astronomical ones. The biggest questions impact all researchers in a field, and waves move outward from there. Can mathematical evidence in the archaeological record tell us something of the history of science in Ohio before 1800? Or in Prehispanic America, in Neolithic Europe, and through the course of prehistory everywhere? Yes, it can. Mathematics and astronomy are universal languages, accessible to analysis. Can we conclude that Stonehenge or Newark, or their associated arrays, are indeed observatories? Far more than alignments are needed to make a firm conclusion. I hope I have shown that investigating claims is more difficult than making them, as others cited have also shown. Nonetheless, big questions deserve some perseverance, especially if they write new history and right old history. I stayed on this path longer, pondering the complexities. If demonstrating advanced astronomy is the research focus (mine is multidisciplinary), the researcher can refocus behind the alignments, on the mathematics of astronomy and cosmography, and on the requisite systematics. Now, at the level of science, the astronomer's chair is an ellipse on a spinning earth, and the moon is a constant foresight to the cosmos, albeit a very peripatetic one. Correctly referenced in space, advanced analysis begins, equating the precise math, local radius, geodetic scale, cosmic scale, calibrating motions, and constructing site dimensions in planes, angles, lines, and triangulation arrays. The coordinate structures the cosmos describes are naturally scissioned with astronomic motions, quod sciam quantities are accurately revealed and intrinsically recorded by luni-solar calendrics after a sufficient temporal span of data acquisition. The researcher takes the mental steps the ancient astronomers and calendar keepers took, recreating enormous temporal spans, reducing variables, factors and time to modern equations—playing with cyber-aedes in the aegis aeries of Jupiter, Aethena, and the Aepollices—inquisitio aequalis aeternus. If a culture attains Galileo's or Kepler's insights, evidence should be there. Obliquity and secular polar shift may also date the geodetic traces of observatories evidencing those achievements, and, hopefully, a trail of temporal clues will also lead back in time. This is the quest I found tempting. The researcher's path has many obstacles, not the least of which is the inaccuracy of past methods and false paradigms—not unlike the path of the first astronomers, of Galileo, and of all minds trapped in dark ages. I took steps learning astronomy to investigate codices, histories lost, and cover-ups of the past. Eventually I realized the steps historical astronomers took inform analysis in any prehistoric context. For example, understanding observer motion and elliptical planetary orbits requires certain known, definable mathematical capabilities. Analytically, a inverse equation prevails; evidence of specific understandings infers certain threshold capabilities, and uncovering capabilities infers knowledge and understandings. "Show me they knew Kepler's law," a little voice on my shoulder whispered in my ear to claims by archaeoastronomers. 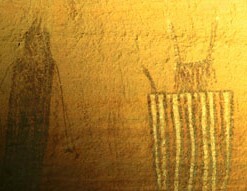 That image repeats in ancient pictographs. The anthro's dilemma is clearly portrayed in the Grand Gallery panel, by a figure on each shoulder. The anthro's dilemna is understanding that the disparate voices on both shoulders are correct, and, perhaps, understanding their perspectives are different because your head is in the way! We forget our two eyes do not see the same thing. Such is parallax shaved to astronomical accuracy. In 1984, at La Hacienda in Moab, a piece of the puzzle fell into place for me while observing new moon and Venus on the horizon, simultaneously eclipsed by the rotating sandstone fundament, the horizon with a vertical cliff. From my perspective both last specks of light, moon and Venus, disappeared at once, simultaneously with precision. A minute latter, from the next window, "The star is disappearing." There and then we directly understood the proportions of our cosmos. Two arches, four eyes, four words, and no more measure nor telescope was needed to know. From only a few feet apart with entirely different perceptions, parallax revealed the geometry, the grand scale of Earth, Moon and Venus. These insights, as rocks and light speak them, were seen throughout time, and they evoked understanding and further inquiry. In poetry, this is how rocks speak to animals. In science, we divide and measure, often seeking the means to run to the other window first, with our monocular view explained. The real work is explaining the different views in a holistic framework. We must rein in a tendency to use number and language and proclaim every single perspective in linear language, without seeing the non-verbal unity in what the rocks say, not hearing that voice of place. If you take the thing apart, you can put it back together, and the pieces must fit. Divide it up wrong, create a false taxonomy, and you've got Humpty Dumpty for dinner. All the kings horses and all the kings men cannot do it, but the scientist must, or the circle back to the question is never complete. There is language and number, and there is actuality. In the end, the scientist must discern the actuality, not the coincidences, not just the statistical probabilities, but the underlying unity. Knowing the precise size of the earth is a very good beginning on the path of cosmic discovery. It is a first step in the use of astronomy, one employing light angles to make a simple geodetic determination using a triangle. The size of the earth was accurately known in remotest history, divided by 365, 360, corrected, redivided, lost to conquest and reconquest, and found again, etc. The builders at Newark attained great milestones, they knew the size of the earth and more, much more. Their unit of length, Observatory Circle's diameter, is a fraction of the earth's circumference, 1/125,000 (= 0.000008 CIR). The distance from Newark to Marietta is circumference divided by days per year, as is their longitude difference. In my archaeogeodesy writings, I also discuss more site-to-site relationships of Newark, Marietta, and other sites, further explaining my conclusion that the builders at Newark knew the size of the earth and much more. 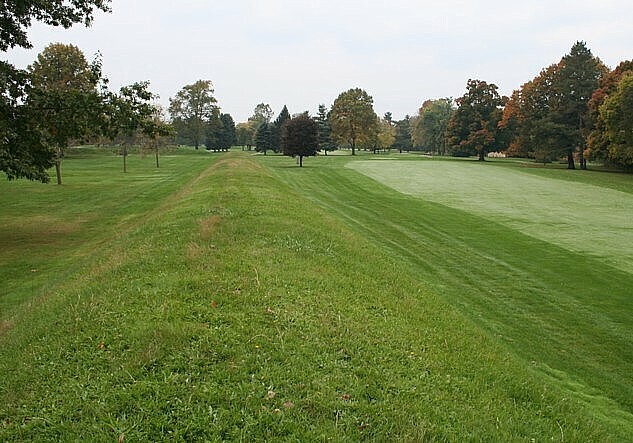 The Ohio chapter in science history is written with and on the earth itself, amidst the fairways at Moundbuilders Country Club in Newark and with many other mounds and earthworks. Thus they wrote their book, directly upon the earth for all time forward. Are the mounds of Ohio a codex or observation records, science permanently (they thought) inscribed on the earth, or maybe records from distant observatories? More study is needed to address these questions. My conclusion: Newark and Marietta are parts of one observatory, and we play and golf on a geodetic codex. Every culture makes smoke. Some burn books. Some have more smoke and mirrors, myths not understood, histories lost, and true history obfuscated or covered up. I've choked on smoke along the 1/36 of circumference from Tenochtitlan to Chichen Itza, along the 1/100 of circumference from Itza to Tikal. From the cosmic gardens of Beijing to Stonehenge and Newark we fly, spewing hydrocarbon toxins upon the world. From Kilimanjaro over Sanchi to Everest we sail in metal boats polluting our evolutionary garden. Nature's howl from Everest ought to echo around and around in Casa Rinconada, then resonate back from Taos, "STOP killing the ONE world, Scion. Get back in the garden." I'm choking on all the smoke and chemicals. The world has never been like this before and we fail to see much of the past, our ancestoral garden. I feel as though I've read a book monkeys can read—the light and angles of the cosmos. I'm happy sitting in my window on time's mountain, seeing the world today and the past with more than one cultural and intellectual perspective, free of the paradigms and misconceptions of my youth. I grip the umbilicus, ready to return around that corner, a teller with stories from other cultures and times, using words and numbers, seeds harvested with the roaming scythe of long observations. I remember trying to figure out which way the earth and moon move. I was a flatlander. Now I see Everest and Huascaran creep towards the equator, knowing the system finds its own equality, geodetic and otherwise, and all else is just the punctuation. One day mythologies will be taught with new heroes and geodetic terminology, not just the names of masters who divided up the Aegean and the slaves. One day, hopefully, humans will breath clean, safe air again, as prehistoric Ohioans did a mere 200 years ago, and the smoke obfuscating lost history may clear. Whether or not the American Indians in the Ohio Valley had climbed past Newton's step on the ladder of knowledge before their conquest and displacement by 1800, and if so, for how long, remains lost history, but only for today. A book is written on the earth. I'm working at reading it. I'm still Finding America and still puzzling too. Attempting to bury the secrets of the destruction is futile; you cannot bury the thing when the whole earth is a book. This book—the archaeological record—will not burn, but it is still being bulldozed away to this day. This destruction, this cover-up must STOP. If you have one inquisition you need a second one, to look from the other side also, two eyes, two viewpoints, two poles, two kinds of minds, two hemispheres, one world. And like astronomers of old traveling to record parallax in distant lands, you must eventually bring the second view back for actuality to be appreciated from the unity of diverse perspectives. Where and when did the first geodesists divide the world? Was it Mount McKinley, Newgrange or Giza, Avebury or Sumeria? Was it the Cosmic Gardens of Beijing or at Newark's Great Circle? Starting to wonder what epoch you are in? Download the calculator. I wrote an Excel spreadsheet, Epoch_2000, Temporal Epoch Calculator, to calculate temporal epoch variation in astronomical constants and obliquity of the ecliptic. Epoch v2009 included an eclipse calculator and more functions. You simply input numbers or select variables from the menus. Epoch Calc v2011 is the new release, with slight changes compared to the graphics below. Please report any bugs. In Epoch Calc, you select an epoch and the variable values change automatically, plus a user value allows input of any date. Epoch Calc also provides a handy set of lookup menus for AeGeo code. Lookup menus are also avilable in the calculations worksheet, for added utility. Software Notes: Initial formulations used in Epoch_Calc_2000 were developed beginning in 1988. I created the formulations programming code in 1992, when Hewlett-Packard loaned me a then-revolutionary, programmable palmtop scientific calculator, the HP 48SX. This tool delimited my code options when creating variables. Terseness of code and of ergonomics was a priority because I had carpal tunnel pain from months of doing trig equations on a calculator. Upper case use, the HP default, resulted and those terms are now converted to lower case. Thanks to Hewlett-Packard's 48SX loan, I was able to complete and distribute Preliminary Results: Archaeogeodesic Study Number One on October 12, 1992. Thanks also to programmability, I resolved the values of all astronomic and cosmographic constants and variables to the accuracy then possible, thus creating the integrated set of variables used in my research, in Epoch_2000, and available in the Astronomy Reference pages. In 1996, when programming for a Macintosh platform, I added the deltaT temporal adjustments formulations to the research application. Epoch_2000 made these formulations available in a small applet and a common format, Excel. Epoch_2000 was incorporated in archaeogeodesy.xls, and updating continued. I spun off v2009 from archaeogeodesy.xls, then added the previous version as a stand-alone worksheet. Watch for bugs, as this is a fresh project for Spring 2009 classes. Development continues, with recent formula refinements yet to follow. Newest releases download from the links. Update v2009.04.09 introduced a more comprehensive variables set with edited terminology and code terms. Update v2009.12.21 presented new formatting. Epoch Calc v2012 has major updates, including astronomy formula refinements and significant changes in derivation of variables. Allen, C. W. 1973 Astrophysical Quantities, The Athlone Press, University of London. Dragomir, V. C., D. N. Ghitau, M. S. Mihailescu, M. G. Rotaru 1982 Theory of the Earth's Shape, Elsevier Scientific Publishing Company, Amsterdam. Markowitz, William 1968 Concurrent Astronomical Observations for Studying Continental Drift, Polar Motion, and the Rotation of the Earth; in Continental Drift, Secular Motion of the Poles and Rotation of the Earth, edited by Wm. Markowitz and B. Guinot, D. Reidel Publishing Company, DorDrecht, Holland. Marshall, James A. 1992 Azimuths of Prehistoric Circle Openings and Parallel Walls of Eastern North America Examined for Astronomical Orientation. American Astronomical Society. 5 June 1992. Taff, Laurence G. 1981 Computational Spherical Astronomy, John Wiley and Sons. Thomas, Cyrus. 1894. Reports on the Mound Explorations of the Bureau of Ethnology. Smithsonian Institution, Washington, D.C.
Cleal, R M J, Walker, K E, and Montague, R 1995 Stonehenge in its Landscape: the twentieth-century excavations, English Heritage Arch Rep, 10, London (ISBN 1 85074 6052; 640p, 295 illus, 26 colour plates). An extensive bibliography of archaeoastronomy articles is on the Archaeoastronomy Page. 1988. Finding America. A Journal of Anthropological Inquisition. 1991. 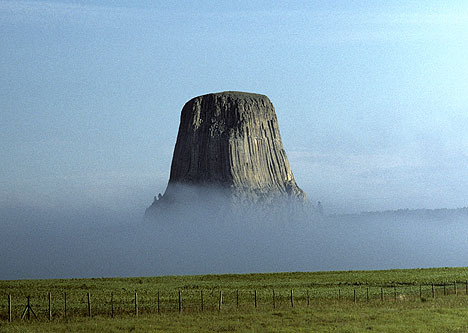 Study Notes: Site-to-Site Relationships of Monumental Prehistoric Sites of North America. 1992. Study Notes: Site-to-Site Relationships of Prehistoric Monuments. 1992. Preliminary Results: Archaeogeodesic Study Number One. 1992. Archaeogeodesy, a Key to Prehistory. 1996. Monks Mound and Secular Polar Motion. 1997. First publication of this web site. 2000. The Possible Geodetic Properties and Relationships of Neolithic Monuments of the British Isles, Preliminary Results. 2001. Possible Geodetic Properties and Relationships of Some Monumental Earthworks in the Middle Ohio Valley. 2002. 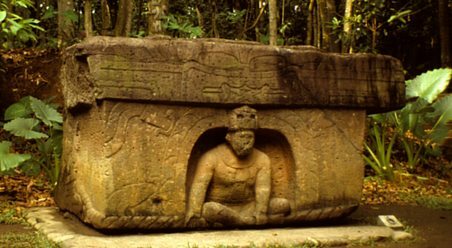 Science in Prehispanic Mesoamerica. Your comments, etc. are appreciated, sometimes necessary: Contact. MLK Day 2006: This essay is dedicated to Martin Luther King, "I have seeen..."
Forever each year people will thank you for your inspiration on this holiday.